This stock home plan from Myles Nelson McKenzie Design has been develop for today’s modern living. 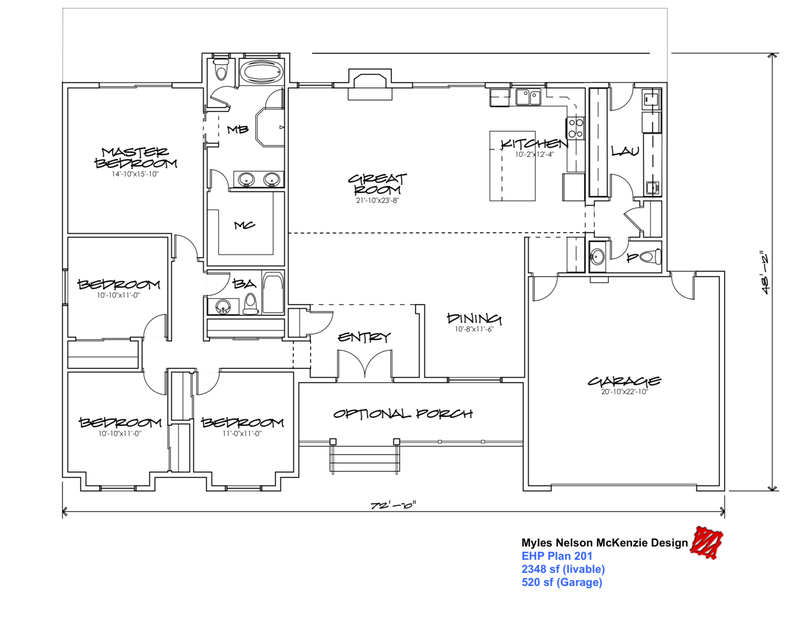 The size of this home plan, number #201 is 2348 square feet. This ranch style home design has 4-bedrooms and 2 1/2 baths. Additionally, this stock home plan has a very large galley style laundry room. The entry hall is next to the open dining area. Also the dining area could be a optional study den. The great room is adjacent to the large size open kitchen with a large island. Optional covered front and rear porches. We have develop two exterior styles for the this ranch styled home plan. The first home style is designed in a Mediterranean design. The second home style is a Rustic Mountain design. This particular home plan can be easily adapted to any particular home style that you wish, such as a country or cottage home style. What do we provide for our stock home plan? All of the above plans are developed with appropriate building dimensions and necessary building notes. Customization of the home plan #201 is available and recommended to fit your personal sense of design. Additionally at Myles Nelson McKenzie Design, we can provide foundation, framing and mechanical plans to meet local city or county building codes for this particular stock home plan. These services are available for additional fee. Contact us if you wish to have this plan customize to your personal needs. We will give you an quote for the additional plans adjustments. Optional Front and Rear Porches. Click on the plan for an enlarge view.